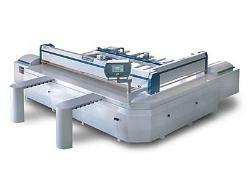 Panel saw is the basic tool for woodworkers. It is used for parallel cutting of wood panels. Manual machines have a movable mechanical end stop which is adjusted by the user according to size. When no electronic display is installed accuracy is depended to user. Fitting a fully automated servo system user does not need to adjust limits any more. Panel is mounted to servo driven cartridge, able to move according to predefined sizes. Accuracy and repeatability is very good. Additional nesting and management programs can co-operate with machine’s controller. Furniture CAD software passes designed drawing to the nesting software. It arranges the pieces in order, for less waste material. Software is able of folding warehouse information, calculate prices, organize orders and pass machine code to the machine.